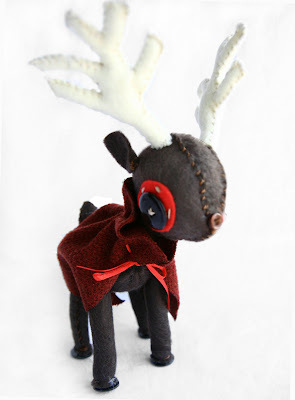 I am so excited about this Christmas Deer! I'll try to shoot better pictures of him tomorrow. I love him! The cape is perfection. Yes, the cape idea actually came from Rudolph. Remember when Rudolph ran away and his dad put on his cape and hat to go look for him? I loved that. how is it possible that your work gets cuter and cuter??? payday is friday and i'm shopping in your store!